VLV HAWAIIAN SHIRT Designer KAHALA Tapa FISH Reverse Print GRAY BLUE WHITE Men's Size L! 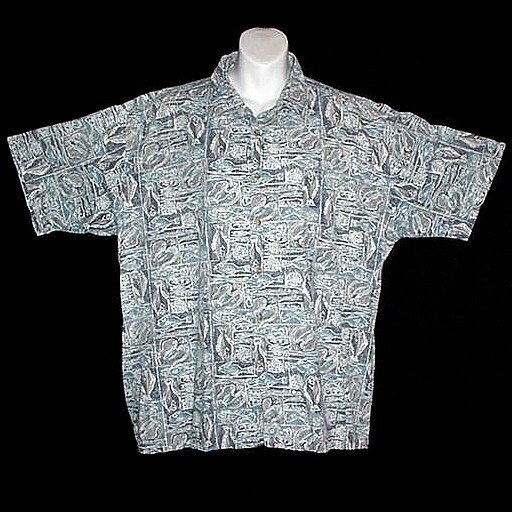 HAWAIIAN SHIRT Designer -= KAHALA =- Tapa FISH Reversed Print GRAY BLUE WHITE Men's Size L! Shirt: Shoulder seam to Shoulder seam across the top 22 inches, Underarm to Underarm/Chest 52 inches around, Waist 50 inches around and Overall Length is 31 inches from the top center back neckline to the hemline!